K-pop fans can look forward to some celebrity-spotting in the month of August when hip-hop boy band B.A.P heads to City Square Mall on 7 August for the “B.A.P Live on Earth Singapore” press conference. Short for “Best. Absolute. Perfect”, this outstanding group of six talented members have won 15 rookie awards from around the world and were featured by the Grammy’s in their “Snapshot: Best of 2012” alongside Psy – an extremely impressive feat given B.A.P’s debut in 2012. They will be performing at the Star Theatre on 8 August with Singapore as the final stop of their Asian tour. 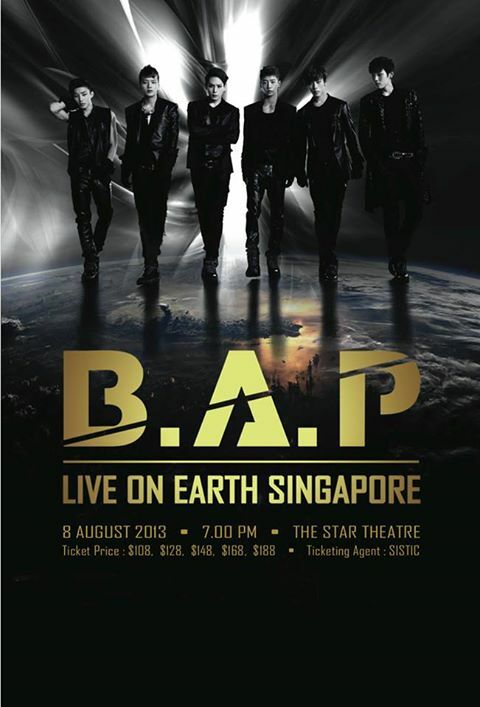 As the official shopping mall for the “B.A.P Live on Earth Singapore” concert, the SISTIC booth in City Square Mall will be the first to commence ticket sales on 7 July 2013 at 10am, one day earlier than all other SISTIC outlets or online sales. The first 200 to purchase their tickets will receive an exclusive B.A.P poster during the pre-sale at City Square Mall. Be sure to grab your copy then! In addition to early bird sales, City Square Mall will be giving away 45 pairs of “B.A.P Live on Earth Singapore” concert tickets (worth S$336) from 7-14 July. Simply be one of the first 45 fans to spend a minimum of $100* at the mall and tell us what ‘B.A.P’ stands for at the Customer Service Counter to redeem your tickets*. What’s more, K-Pop music lovers can see B.A.P during their Press Conference at City Square Mall, Atrium A, at 7.30pm on 7 August 2013. The first 500 fans at the event will receive an official “B.A.P. Live on Earth Singapore” concert poster. Warrior was the first song I heard from them. Frankly, it left an impression on me cos all of them were blonde :P Love the powerful raps! And their next release was an awesome one too (ooo love the dance)! I liked it more than Warrior! But my favourite song is.. This is my favourite song from them! Catchy but most importantly, they're SO CUTE.